What is the end result of the comparison survey? Want to see the result and i believe The survey already closed at nov 22nd 00UTC? Hi, Prakash: I’m in the process of putting all of the data together right now. Hopefully, I’ll have it complete by the end of the day. Will we start seeing SSB in the PL* series from Tecsun? I have had both radios and got rid of the PL-380, based on the fact that it did not have an external antenna socket for shortwave which bugged the hell out of me. The soft mute on the PL-310ET I think is improved on the original PL-310 and very similar to the PL-380 (although don’t quote me on that!). The keypad on the PL-380 is much better in my opinion (softer touch), on the PL-310 you have to hit the buttons a bit harder, although this is not a problem for me. 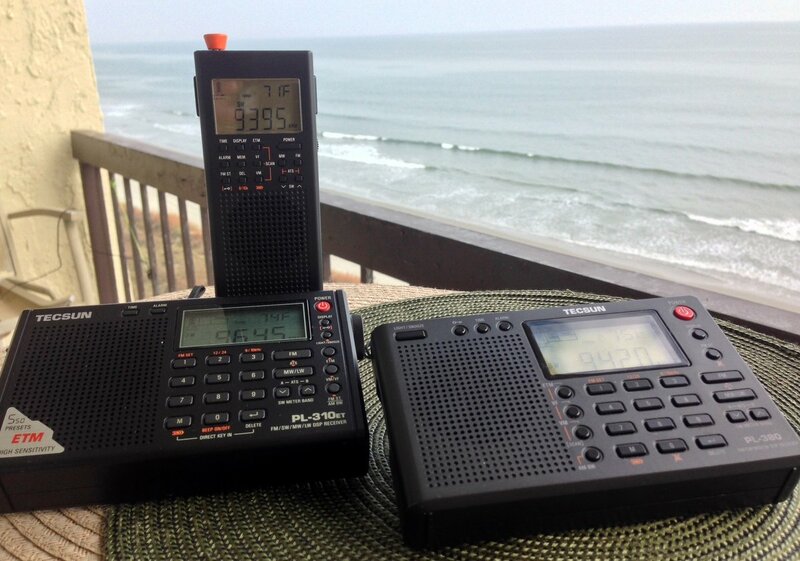 The original PL-310 does not have ETM like the PL-380, the PL-310ET does (hence the ‘ET’ suffix). The PL-380 also has an indented tuning knob where the PL-310(ET) has a proper tuning knob, I also prefer the PL-310/ET tuning. The PL-380 is probably better for travelling as the knob will not catch on anything in a suitcase. The PL-380 is also a bit smaller (not by much to sway anyone). If you are not bothered about the knob/external antenna socket on the PL-380 get it otherwise stick with the PL-310ET. Apart from that, features are very similar on both radios. Some will say, why do you need an external antenna on a portable radio? well I use my PL-310 daily in the shack hooked up to a mag loop to reduce interference and the radios performance is staggering considering the money. To be honest, I have only ever used the ETM feature a couple of times, as I tend to program in the stations I listen to rather than fill the memories with non-English broadcasts my poor brain cannot decode. When they release the PL-310SSB I will be the first in the queue….a bit like those dudes outside the Apple stores when they release the new iphones…..ok, maybe not that daft. Of course, this is my opinion and others will vary. Cap, Thanks to you also for the very helpful information. I read your reply a few days ago, but didn’t get a chance to fire off this note until now. MikeG, the most apparent difference between the 310ET and 380 is that the PL-310ET has an external FM/SW antenna jack, which the PL-380 does not have. Paul, thanks for the info. I think I read that the 310 had the external antenna jack. Besides that, it seems that the 380 has slightly smaller dimensions. I wasn’t sure if there were some other small differences. I’m really curious as to the results of this shootout, since it seems that all 3 samples really differed in quality. I had a clear favorite, but I don’t want to post my responses as to not bias anyone else. Thomas, when you post the shootout results, can’t you also mention the difference in feature set between the pl-380 and the pl-310? I’ve been interested in a pl-380 for a while, as a smaller alternative to my Sony, but for the life of me, I have no clue what the difference is between the 380 and 310. Well, I don’t think you need to ask me…..PL-310ET. Saying that, I haven’t tried the CountyComm GP5/SSB which may beat the PL-310ET by purely having the SSB capabilities, that could be the number one for me, once they release it of course. Why is the sound of Radio 3 out of phase between the right and left channels? Good question, Gary! The audio sounded consistently out of phase on that particular radio no matter how firmly I inserted the audio patch cable. I chalked it up to how the DSP chip produced the audio. I am right now in the middle to decide between PL310ET or PL380. Have been waiting for such comparison like these for 2 weeks(since i got to know about these 2 radios).This result will definitely would help me to find out which one to go for. I haven’t tried any of the radios except for the Tecsun 310ET. But I have to say I think this is a fantastic little radio – probably the very best I’ve owned for under $50 and that size. Well built and reception on SW and FM is just great. Well worth the $38 I paid.